This page refers to collectibles in The Lost and Damned and The Ballad of Gay Tony. For the Grand Theft Auto IV equivalent, see Flying Rats. For the theater at Star Junction, see Seagull Theater. A seagull in GTA V.
Seagulls are collectibles in the episodes The Lost and Damned and The Ballad of Gay Tony for Grand Theft Auto IV. They are similar to the main game's pigeons in which they are "collected" by shooting them. Like the pigeons, seagulls can be located by homing in on their distinctive sound, and they are surrounded by a glow which makes them easier to locate at night or in cloudy weather. There are 50 seagulls total in both games. All 50 in The Lost and Damned were found by the gaming community within five days of release, before any official information was released. Collecting all seagulls will reward you an Innovation outside your second safehouse. The reward for collecting all of the seagulls in The Ballad of Gay Tony is an APC at Yusuf Amir's construction site. In Grand Theft Auto V, Seagulls return as a wild animal. While the player can shoot Seagulls they will not receive an award as they do not serve as a collectible. They can be found throughout Los Santos. The player can also play as a Seagull in the PlayStation 4, Xbox One and PC versions of the game by eating a Peyote Plant, which will cause the protagonist to hallucinate that they are an animal. TLAD map of the Seagull locations. TBOGT map of the Seagull locations. 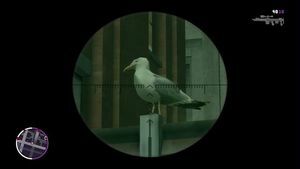 In Grand Theft Auto: Vice City, Grand Theft Auto: San Andreas, Grand Theft Auto: Liberty City Stories, and Grand Theft Auto: Vice City Stories the player is able to shoot down seagulls with a sniper rifle. They can then check their stats menu to see the "Seagulls Sniped" stat, tallying the amount of seagulls they have shot down. This doesn't give the player any reward however. Flying Rats - Grand Theft Auto IV equivalent. Security Cameras - Grand Theft Auto: Chinatown Wars equivalent. Info for finding all 50 seagulls with maps, pictures, and descriptions on Gta4onlineguide. GameFAQs topic, all 50 seagulls found.